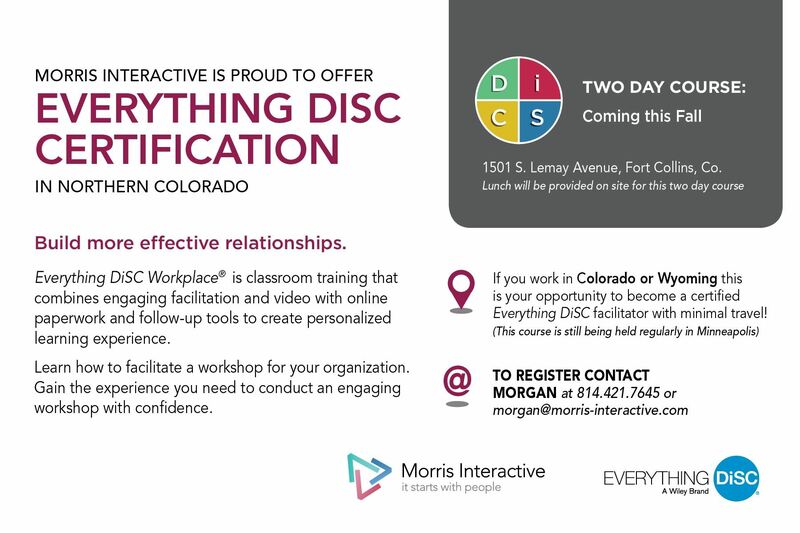 Morris Interactive has seats available at its Everything DiSC Certification coming up on November 15th & 16th, in Fort Collins, CO, and they want to offer YOU a significant discount. The workshop runs from 9-4 both days and breakfast and lunch are included. To learn about the Everything DiSC profile, check out this sample profile or this video. If you've been looking for an opportunity to earn certification in a great training program at a great price, contact Morgan at 814.421.7645 or morgan@morris-interactive.com. Please note this is a sponsored announcement and ATD-NRC is not facilitating the registration process. We're just sharing the great news! You must contact Morris Interactive to discuss pricing and to register.